On hot summer evenings, I generally prefer to eat light. Before I ate Paleo, sometimes I would just have fresh veggies in a light salad with some dressing. 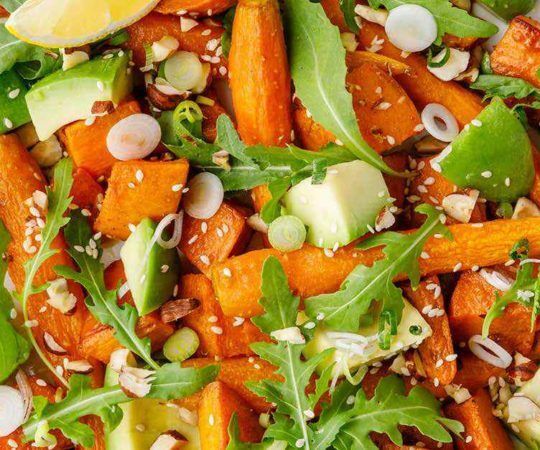 And while there are days I could probably be totally satisfied with just veggies, I know now that I have to add protein to make sure I stay full longer; those veggie-only dinners would generally lead a few hours later to snacking. So when I’m in that mood, I’ll cook a piece of fish and pair it with a bright, flavorful salad. One of my favorites is this cucumber salad. 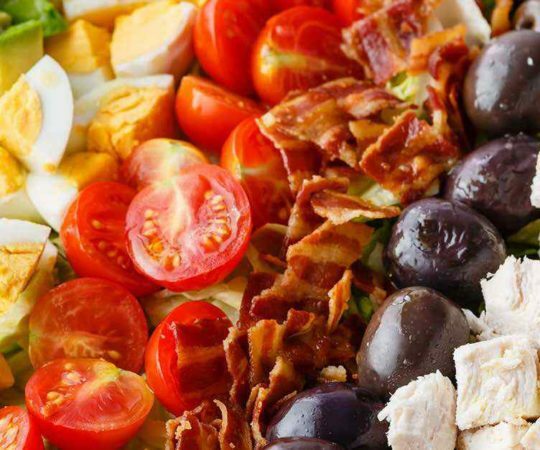 I have a friend who often orders salads at restaurants but she almost always asks for the salad without lettuce. Inevitably, there’s always someone at the table who is befuddled by this. Julie always answers the same way: “iceberg lettuce is a waste of chewing time.” Now, I’m not as anti-lettuce as Julie, but I see her point. 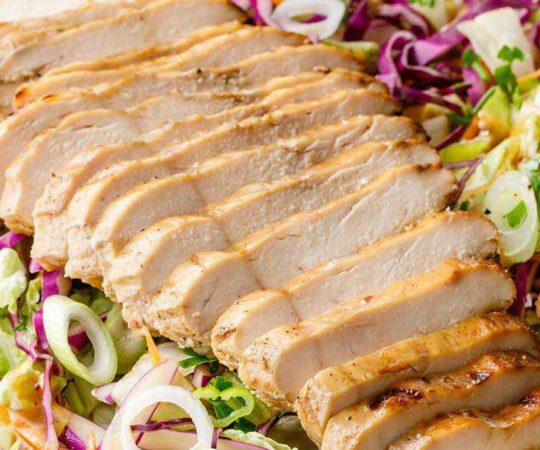 There are very few vitamins and nutrients in iceberg lettuce (the kind of lettuce most restaurants use for salads) and why not focus on the good stuff in the salad? Peppers, cucumbers, tomatoes, carrots… mmm. Now… here’s a little secret… in the recipe, it says “serve immediately.” And, for sure, it’s great as soon as it’s all mixed together. 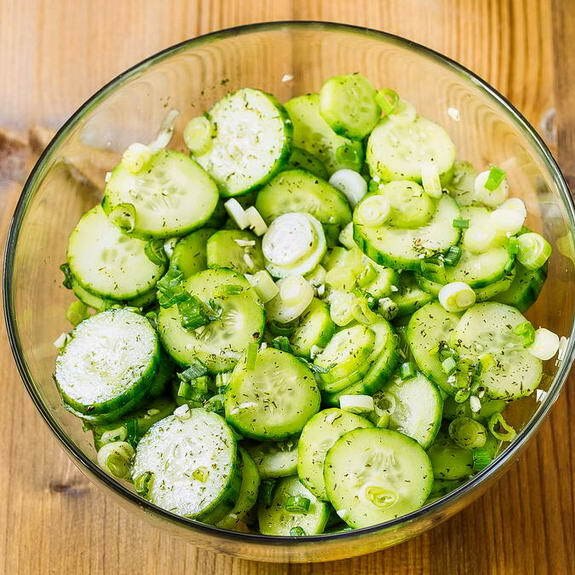 But if you’re a fan of the bright flavor of vinegar, put any leftover salad in a large baking dish so every cucumber is sitting in the vinegar mix. Cover and chill overnight and the cucumbers will really soak up that vinegar-dill flavor. 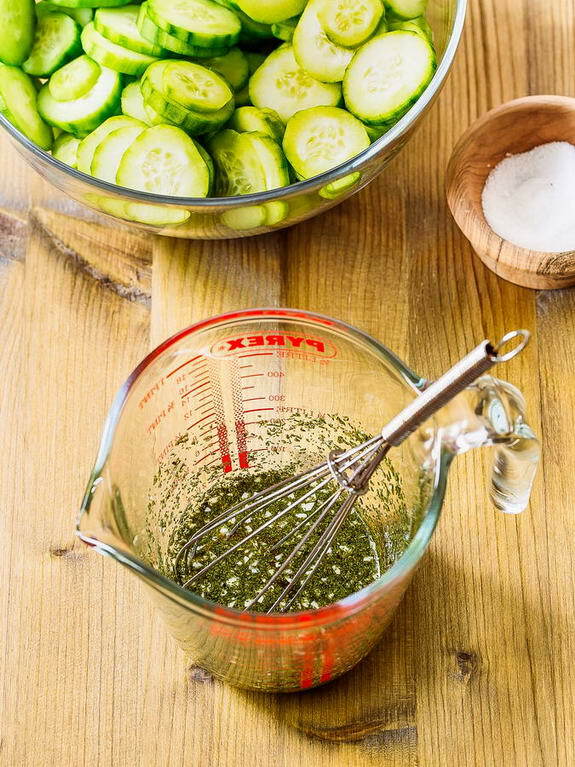 You’ve basically taken the first step towards making dill pickles! But your cucumbers will still be crisp and the flavors will be nice and tangy and bright. Enjoy! I love cucumbers, usually soak them (sliced) in 1/3 vinegar, 2/3 water, sliced onions, just enough sour cream to make it slightly thickened up, pepper. 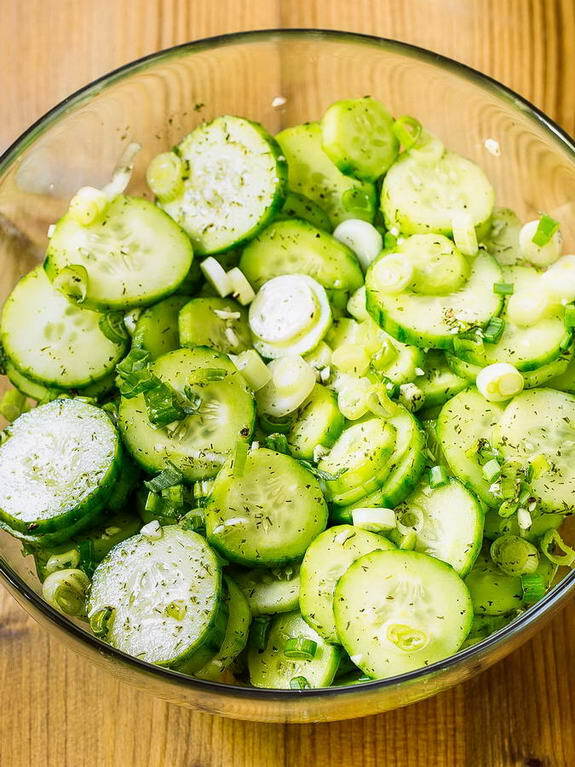 Your recipe sounds good for a change-up, I am going to try this “Best cucumber salad” never thought about dill, sounds great. I have always loved cucumbers, and buy Kirbys. My salad is similar. I cut cucs into very small pieces, small pieces of tomatoes and onions. Of course, salt, and use olive oil and a tad of balsamic. Love it. I do the same thing except that I love fresh garden tomatoes and Visalia onions in it. So fresh & cool tasting, best coolest summer dish. Peppers and tiny tomatoes are a tasty and colorful addition. The cukes should be sliced, sprinkled with salt and left to sit for 15 minutes or so, then drained of any liquid before dressing. That takes away any bitterness and helps keep them crispy. So glad you are enjoying this salad. 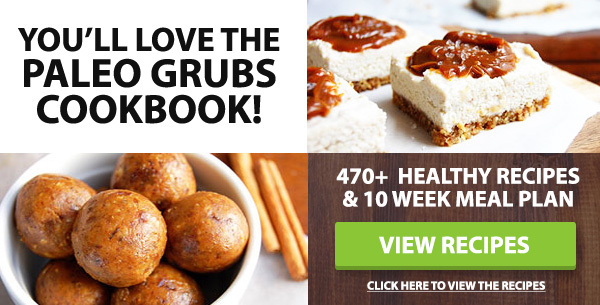 But do tell…what is Dragons Breath Chicken? I’ve always lightly salted the sliced cucumbers and let them sit in a colander for several hours or overnight to let the bitter liquid sweat out. They are nice and crisp. 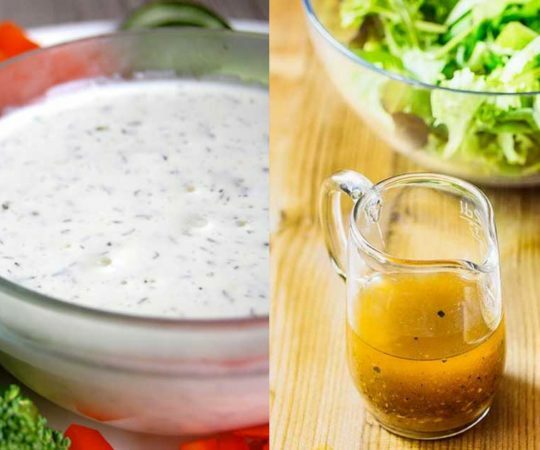 If you do not soak them the bitter liquid will leach out into your dressing. Have you tried this? I salt the cucumbers and set them between paper towels to leach out some liquid. Only takes 45 minutes, then squeeze gently. Still crisp. Will try this recipe. I just made this tonight for our picnic by the river tomorrow. I put the dressing on it to let it meld overnight. I gave a sample to my hubby and he said “This is really good! 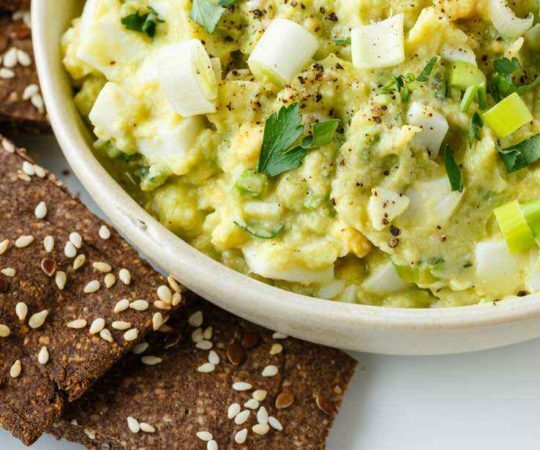 Why can’t we have this more often?” Being of Hungarian heritage he used to eat cucumber salad as a kid and the one time I had it, they used a creamy dressing that was rather bland. I never thought I would ever make cucumber salad after having that. I put about a tbs of freshly dried dill I grew on my balcony and it is really tasty! I cut back the salt just a tad because I tend to like less than most people. I will add this to my repertoire of regular recipes to make! I use a similar dressing on my potato salad, which always has cucumber, boiled egg and a shredded carrot added. Yummiest ever. My daughter has insisted on iceberg lettuce on her sandwich for years. “More Crunch”. While I understand lack of nutrients, the crunch factor still makes iceberg a good choice when balanced correcly. I know I’m in the minority but I hate dill. What would you suggest instead? Dried mint. It’s a delicious combo but perhaps I’d eliminate the honey then. Sounds so good. Always loved cucumber sandwiches. Buttered bread. 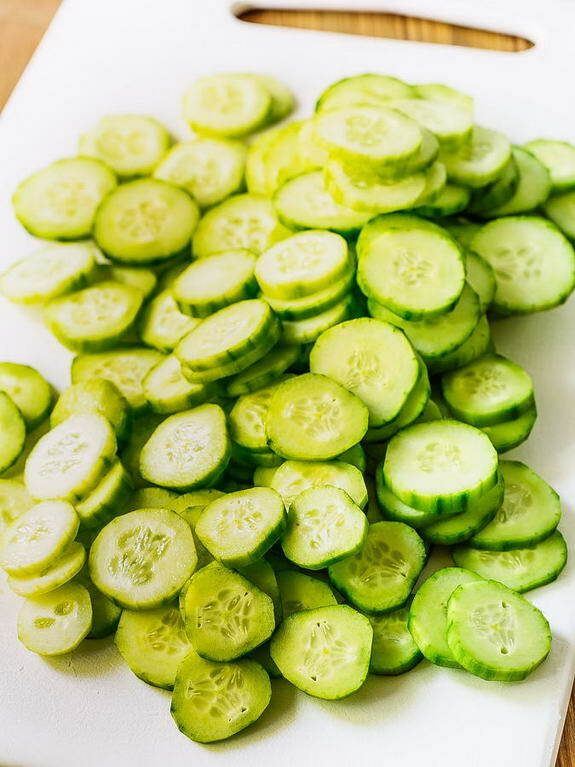 Sliced cukes. Salt and pepper and cukes drizzled with malt vinegar. Divine. But now a thing of the past so will try your salad as replacement. Get the feeling it will hit the spot. ? I use rice wine vinegar (no sugar added ) with tomato quarters, small bits of cauliflower, sliced red onion, kosher salt and freshly ground pepper (sometimes hearts of palm). The rice wine vinegar, low acidity and flavorful, is bought in a large size bottle at an Asian grocery store. I don’t prepare cucumbers other than rinse and slice them. When the veggies are gone, I refill the used vinegar solution in my storage dish with more veggies and add some fresh vinegar to it. Always have this cucumber salad in the fridge in the summer time. I start a fresh batch after the third refill. And it is low calorie and low carbs! 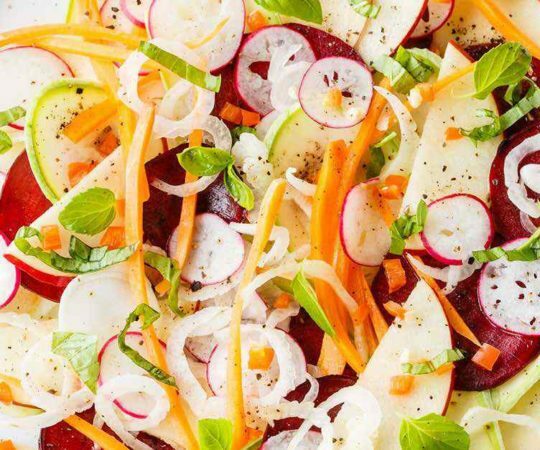 I like to add finely sliced radishes and sweet onion to my cucumber salads, with Rice Wine Vinegar. Do you recommend English or regular cucumbers? How many cups of sliced cucumber would you use? Thanks. This was quite nice with dinner tonight, thanks! 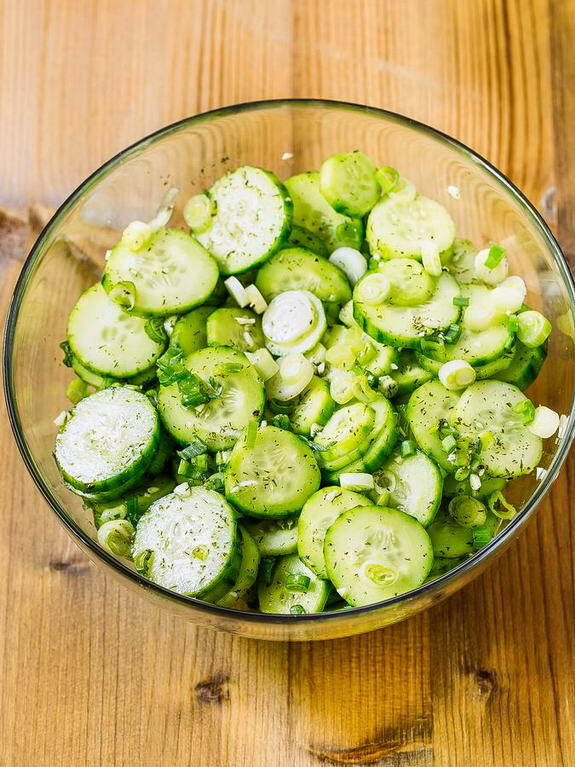 Great recipe idea for Cucumber Salad! They look delicious! Can’t wait to try all of them! Cheers!! Just made this. It’s tasty and I’ll make it again! I read about iceberg lettuce being a waste of chewing time so I thought I would tell u about a friend who has prostate cancer and blood probs.. He can only eat iceberg lettuce..all the others affect him bcos of Vitamin K prob.. Choice of cucumbers is so important . Large spongy cucumbers with rhino hide skin are a no no. Chose a crisp cucumber which will have small tight seeds and preferably a thin skim. Cucumbers which are generally not quite ready to plant are the way to go!! The dressing sounds good but fresh dill is far more fragrant,and less is required. I have just begun to make the sauces from Paleo they are so delicious I can’t believe I ate the bought stuff ?I made the terryaki sauce delicious ?Thank you for all the wonderful recipes ?I always look forward to the next meal am making and so is my husband ? I’ve been making cucumber salad for years, with a no measuring method, with cucumbers I’ve grown. Slice the cukes thinly, add thinly sliced onion, regular or sweet, equaling 1/4 to 1/3 the cucumbers, by volume. Toss with enough olive oil to thinly coat, add red wine vinegar, dill and fresh ground pepper to taste. I usually let mine marinate before serving.